This is a yoga retreat and not just another holiday. For those who wish to deepen the practice and learn more about yoga than you can get from just weekly classes... And we’ll have fun too! Yoga - practiced daily, you will really feel the difference. Due to demand, I have decided to run a retreat this autumn. Each day, there will be practices of Asana, Meditation, Pranayama and some investigation into dharma & yogic teachings and how we can practice yoga both on and off the yoga mat. We’ll keep a part of each day in silence. You will enjoy this. We will spend the last day as a holiday to relax and enjoy other activities offered there before coming back to London. It may be a nice idea to book a 2-week holiday to spend a few more days in Morocco afterwards, either at the venue or traveling around this amazing country. (If you would like to stay at the venue after the 8th, please contact the venue directly to book your room). There are only 2 places left. Cost: £690 p.p. (based on 2 people sharing) for 7 nights / 8 days. 1 x meditation/pranayama session, 2 x yoga asana sessions/day. Flights and travel insurance not included. *As the retreat date is approaching, the payment is now required in full. It can be made either by cheque or be paid directly into Aki’s account. Please contact Aki for the account details. 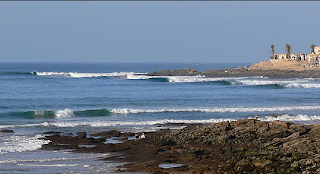 The venue, Surfmaroc is located in a small quiet fishing village of Taghazout, about an hour from Agadir in northern Morocco. It offers beautiful Killer's Bay apartments and a lovely yoga space with the views of the ocean and mountains. For more pics of the accommodation. They serve delicious, nutritious vegetarian meals. Many companies fly directly from Gatwick to Agadir. They are inexpensive this time of the year less than or around £200 for return. 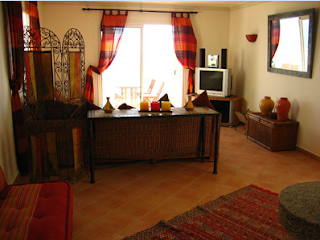 Some of the cheap flights run on 7 or 14 nights basis and will be good if you are planning a 2 week holiday in Morocco. Please note that the deposit is non-refundable after June 30th. Before June 30th, £150 will be refunded. If you can find somebody else to take your space then all of the deposit will be refunded. The week will be a precious time we take aside to retreat from our habitual ways of doing too much, being “on missions” or cluttering our minds with 'un-witnessed' thoughts. Instead, we'll make space within (and without) to be quiet, so we can meet who we really are when we allow ourselves to "be". Daily practice of Yoga will help us through the process. I would like this week to be something like that and it usually is on my retreats. 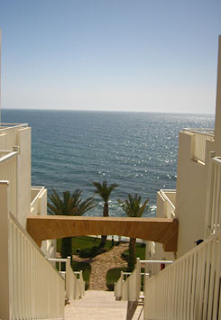 All that in the beautiful location of the Moroccan seaside. I am running a series of workshops on Restorative Yoga in and out of London. Please see the details bellow. Please contact the venue/organizer for booking and other enquiries. If you have any question about the restorative yoga, you can contact me directly. Details to be added when ready. Yoga is now very popular everywhere and people are benefiting greatly from this ancient art and wisdom in all aspects of their lives. However, the current trend of the practice sometimes can be just a continuation of our habitual way which is another “self-improvement project”, a kind of pressure we put ourselves under. The life styles we lead are often so busy and tend to deplete us of our energy. In order to get healthy we add yoga classes to our already busy schedule. Of course yoga is beneficial, but striving in yoga practice is not always helpful when what we really need is to rest, relax and recharge. A lot of us find it difficult to find the time for deep relaxation and rest or worse still; we find it hard to give ourselves permission to rest and do nothing! Because “we are not supposed to! !” This pattern creates a vicious circle and will contribute toward decline in health in the long run. We keep running on empty until we can no longer continue, reaching the point of sickness, emotional or mental break down. What we really need to learn is how to rest when we need to, so we can carry on and enjoy our lives with good health. Restorative Yoga practice will allow you to continue with your yoga practice without further depletion of the energy - and restore the energy that was lost. It is a beautiful practice of stillness and insight, which brings rich landscape of experiencing our inner-self. They are open to all levels of experience in Yoga including the beginners and those suffering from some physical conditions that are not able to participate in ordinary Asana practice. Especially recommended for people who suffer from stress or fatigue. If the case is severe, please contact Aki prior to the booking. For teachers who wish to learn how to practice restorative yoga in order both to include in their existing practice and to teach their students. Attending one of the introductory sessions prior to attending this workshop is strongly recommended, as it will help you understand the nature of the practice better. Aki is a dedicated teacher who has studied with some of the world's greatest teachers. She encourages her students to recognize the subtler elements of their yoga practice by cultivating inner awareness. She studied Restorative Yoga mainly with Judith Lasater, the leading teacher in this practice, and Donna Farhi. Having realized its benefits, she now teaches Restorative Yoga extensively and leads workshops and courses across England. This is my work as a Somatic Movement Therapist. It is run as a clinic, and is based on Integrative Bodywork and Movement Therapy (IBMT) and Body Mind Centering (BMC) and developmental trauma therapy based on NARM (Neuro Affective Relational Model) approach. It is usually a combination of hands-on bodywork, dialogue, movements and some other forms of therapeutic methods, for example drawing, may be used, depending on what’s required. It can address both physical and psychological issues, including trauma healing process. It is a process oriented work and is more effective over several sessions or regular sessions over a longer period. If you would like some sessions, or need more information about this work, please enquire. For NARM sessions, Skype is also available. For visit sessions, I charge £80 / session (first session £90) plus a small extra cost might be charged depending on travel time. Each session will be 1 hour to 1 hour 15 min, unless agreed otherwise. Where: Sessions are held at my place in Queen's Park in North West London, or I can do visit if it works out better. Otherwise a suitable space can be hired in rare circumstances. If a space is hired for a session, the cost of hire will be added to the session fee. For Yoga Private Tuition, I charge £85 for an hour session. The same cancellation policy as above apply. No membership nor booking required. Just turn up! Aki is also available for private sessions for both Yoga and Somatice Movement Therapy. If you are interested, please follow the link. Now and again, it is necessary to seclude yourself among deep mountains and hidden valleys to restore your link to the source of life. Breathe in and let yourself soar to the ends of the universe; breathe out and bring the cosmos back inside. Next, breathe up all fecundity and vibrancy of the earth. Finally, blend the breath of heaven and the breath of earth with your own, becoming the Breath of Life itself.